Substance Designer - Discussions - Re: What is the correct UV for this model? Substance Designer - Discussions - What is the correct UV for this model? I was under the impression this was the correct UV as every little piece has been separated in cinema. I'm not sure why they're all overlapping in Substance. This is as close as I've got with a box projection. but still doesn't look right. which is very similar. The material looks okay from a distance but it's the small fragments of the model where it appears to be stretching around the sides. I though by separating and flattening every individual piece of the model it would work. What am I missing here? That's not really a cube, in the proper sense... The material is stretching because you're taking a square UV and placing it on a very rectangular face. Redo those UV's. Make them the same shape as each face. If you cut out a paper version of those same uv's, folding it up should result in the same shape as your model. Thank you. That's just made everything make sense. I'm importing a very simple building model into Substance Designer as an fbx and the material is stretching. My first thought is obviously my UV is bad but it's a cube, you can't really screw the UV up. If I increase the resolution of the material it improves but it still doesn't look right to me. I'm still having a super hard time getting SD to work with Arnold for Cinema. I've been watching some of the beginner videos for designer to get to grips with the program and everything makes sense, I can get myself around the program. When I import my models into designer and apply my textures they look great, everything is working, what I can't do is translate this to arnold. There's so little support out there for cinema4d I've scoured the internet and have only found bits and pieces which I've tried to make sense of but still struggling, any help is much appreciated, I've had a subscription for 3 months and not made any use of it yet; I need a breakthrough! Anyway here's the problem. The texture I'm using is Thick Snow Cover. If I open it inside cinema without making any changes there's no problem. 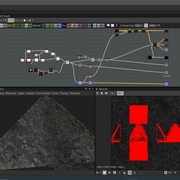 However if I open it inside substance, use the arnold converter (from this tutorial https://www.youtube.com/watch?v=k3h-DzGBLt4) and publish it out I get the 'invalid substance error'. I follow along with Wes' tutorial, then publish this out. How does this set up look? I hope I've provided enough information I'm desperate to getting cracking with substance, all my modelling is done I just need quality texturing to take to the next level! I'm trying to figure out how to use substance with Arnold and I'm getting some results which kind of work but I don't fully understand my method or that I'm doing it correctly. I do plan to make use of substance painter and fully understand the software and process in the future but currently I'm just looking to grab a hi res texture and plug it into arnold. I have a bunch of materials, here's my process. I have, Diffuse, Basecolor, normal, specular, glossiness, roughness, metallic, height. 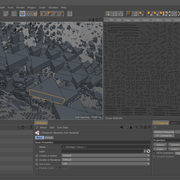 This is my set up: Open up arnold network shader, drop in the maps. Grab a standard shader. Basecolor - Is this the same as diffuse? Specular - I put this into specular color, however the image is all grey and doesn't look like it's transferring any information. Glossiness - I don't know where to put this, it seems like this should be used instead of the specular map. Metallic - The image is all black, I have no idea where this plugs into. I have a steel material also, would this be a different set up to concrete? Sbsar files... they don't seem useful for I'm trying to achieve and that's all substance live seems to have. 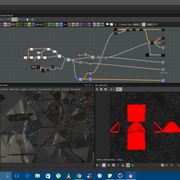 So this my experience working with sbsar files and cinema/arnold. I download one - open it up in substance - create a new graph - follow the arnold/maya tutorial on this site, using the base color converter - scale the texture up to 4k - everything seems sweet, I export with no errors. 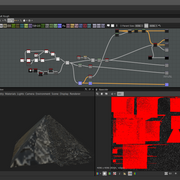 Open it up inside cinema using the substance plugin - I get the invalid file error - the material doesn't display anything. Now if I just use the sbsar file and go direct to cinema without editing it will work fine, but the resolution is too low and it looks crappy. I did find an sbs file on substance and my results were better, however the arnold conversion method from the tutorial still didn't work. Anytime I try to save my own version out of substance I get an error in cinema. 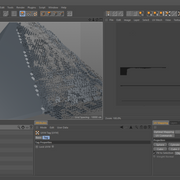 The only way I can achieve what I'm after is open up the sbs file - bump up the resolution and then save over the original - go into arnold shader network and plugged the desired channels from the sbs into a standard shader. Apologies from rambling. Basically what I'm getting at is, Sbsar file don't seem much use, they're low res and I can't/don't know how to change that. Any suggestions on this? Second, is my method for integrating into arnold okay? without using the base color converter? I'm trying to figure out the workflow for getting materials from Substance Live and applying them to my models in Cinema with use with Arnold. I have the substance plugin for cinema and I know Arnold has the substance node support, so I've had a quick little play around with these using a texture from substance live. The texture didn't look great so I know there's more to it than a few drag and drops. How does displacement work in Designer? Is that the 'normal' node? I have a decent understanding of the Arnold Shader Network and I can see the similarities to how Designer works, I'm just trying to understand how things translate.